The first original narrative film in America . . . was plagiarized, of course. Nonetheless, it serves as the starting point for the generation of ideas that would lead to full-length stories on film. 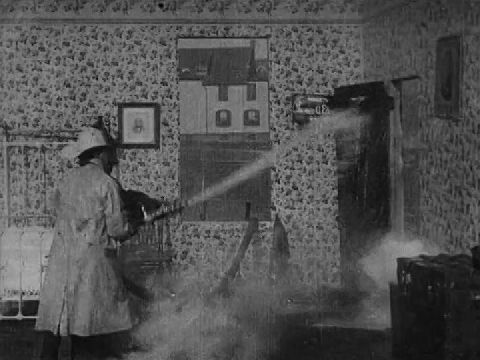 Edwin S. Porter is best known as the director of The Great Train Robbery, but he filmed Fireman before it. It’s a rip-off of, or “tribute” to, English filmmaker James Williamson’s Fire! Of 1901. Plagiarism ran rampant in the film industry of the time (as it still does), as pioneers searched for stories and formulas that would make money. In this case, what could be a better choice for a visual medium than the excitement of a fire, and easier to film? Amateur and professional firefighting companies were prominent sources of civic pride at the time. The heroics of firemen made them larger-than-life figures, and their aggressive, macho ways created a “Bowery b’hoy” subculture that dominated the rough-and-tumble New York City of the early 19th century. In theaters, a series of plays about the rough but sentimental Mose the Fireman drew consistent crowds of rowdies, such that theatre was considered suitable only for men for decades in the city. So, firemen were ready-made heroes, and the charging teams of horses pulling pumps and hoses to the scene were perfect for the camera. Porter freely mixes staged, “narrative” shots and outdoor, “documentary” shots, bestowing verisimilitude to the stagey scenes and giving the “actuality” footage context and narrative heft. The opening scene is a trick, split-screen shot. We “read” the shot from left to right, as a fireman in a firehouse sits and indicates he is “thinking,” as the vision of a mother and child going to bed fade in and out on the right. Is the fireman thinking of his own family? Is this a premonition? Foreshadowing? We fade immediately into the picture of a fire call box. (Porter uses dissolves, not sharp cuts.) Someone rings it, we never see who. We are treated to very functional, straightforward scenes of firemen suiting up, sliding down the firehouse pole, harnessing their teams. A long, continuous shot shows an array of fire equipment coming at a slant past the camera, from right rear to left front, an old Lumiere trick that emphasizes the speed and changing size of the approaching vehicles. The fire and rescue and then shot twice, once from the interior perspective and one from the exterior, the actions matching as closely as possible. What’s so frustrating here is that all the elements are in place for parallel editing — the cutting back and forth from different perspectives to create a narrative. In fact, for many years scholars thought Porter had invented that with this film, as someone later took the footage and cut it together in precisely that way. It took an examination of the film’s paper prints in the Library of Congress to dispel that myth.